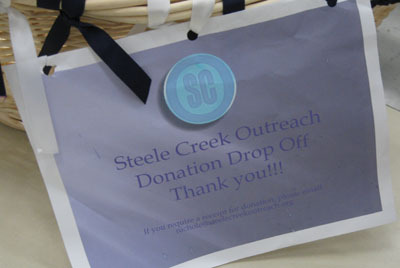 (February 12, 2011) Steele Creek Outreach was formed a few years ago by a group of women from the Berewick Community of Steele Creek. It now has over 30 volunteers who work to supply food and necessities for the homeless and others in need. A major focus of the group is to collect and purchase small personal items to assemble into 120 goody bags for Charlotte street homeless. Members of Steele Creek Outreach will be accepting donations at the Steele Creek Residents Association Meeting on Thursday, March 3 at Southwest Middle School. Items needed include bottled water, hand wipes, packaged crackers, granola bars/breakfast bars, hand warmers, pudding/applesauce cups, lotion, toothbrush/toothpaste, cough drops, chapstick, and other packaged items. Another focus is Operation Mayday, which is joint partnership between Steele Creek Outreach and River Hills Community Church of Lake Wylie, SC. Steele Creek Outreach donates food from its pantry to the Church's pantry. They have a drop off location at the Berewick Manor House, located at: 6625 Berewick Commons Pkwy. Monetary donations can be mailed to: Steele Creek Outreach, PO Box 38532, Charlotte, NC 28278, or via paypal at: contact@steelecreekoutreach.org. For more information see the Steele Creek Outreach Website or the Steele Creek Outreach Blogspot or contact them at: contact@steelecreekoutreach.org.